We had sweet, delicate, freshly-caught Dungeness crab on the Newport coast tonight for my parents’ last dinner here in Oregon. I know I’ll take flack for this, but I think I like Oregon’s crab better than Maine lobster or Baltimore’s blue crabs. It’s less rich. Our timing couldn’t have been better. 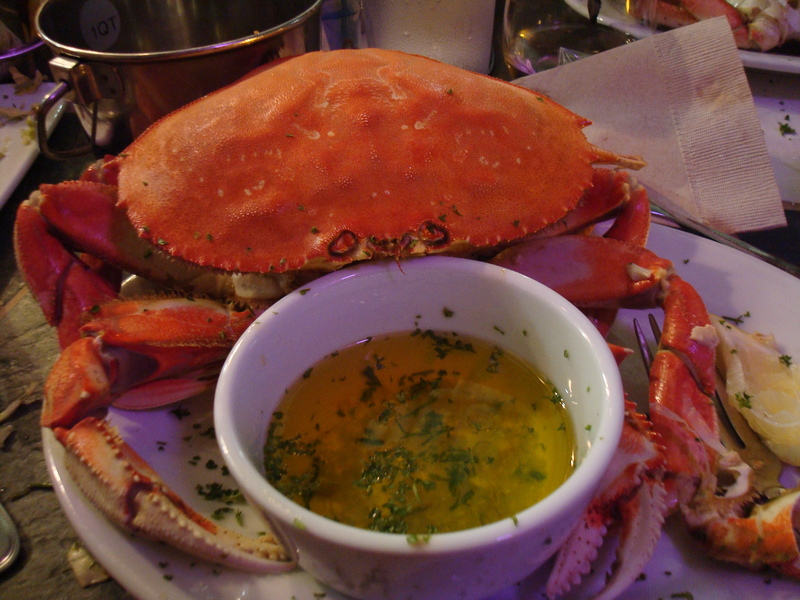 Dungeness crab season commenced Dec. 1. The crabbing appears to be sustainable and well-regulated here. I recommend the Local Ocean Seafood Restaurant and fish market, where we ate, right on the Newport harbor. Raw crabs retail at the market for $4.50/pound and the staff is quite friendly. Before dinner, we sampled beers at Newport’s famed Rogue Brewery. It’s by no means our favorite micro-brew here. But I liked the Hazelnut Brown Nectar and the Honey Orange Wheat enough to bring 22-oz. bottles of those home. We had a great visit, and the Dungeness crab was great, but I have to speak up for the Maryland/Virginia side on fresh lump blue-crab crabmeat and for Maine on lobster. Of course, we love all three and fortunately don’t have to choose a favorite! Virmania? Sorry, but I really do think I prefer the sweet, mild flavor of Dungeness. But more than that, I prefer to eat local seafood. So when in Maine, I’ll still relish lobster. It just was obscene to see that hotel advertising fresh Maine lobster in Newport, Oregon! people are probly sick of crab there ..
Sick of crab where, in Newport?